I once overheard an eighth grade student admit, “I don’t know what I want to do when I grow up.” She went on to say that some of her friends already know what they want to be (one wanted to be a veterinarian), though she couldn’t imagine it. When I was in grade school, I couldn’t imagine growing up either. I did my homework, I followed the rules, I watched TV, and I read books. I didn’t worry about what I wanted to do or who I wanted to be until I was faced with the reality of job applications. I remember taking a survey to match my interests with possible jobs. It was called the “Strong-Campbell Interest inventory of the Strong Vocational Interest Blank” (I looked it up). It matched me with jobs as a fine artist, a photographer, a musician, an advertising executive, and a florist. I shrugged it off – the results weren’t helpful or encouraging (at the time, I didn’t draw, paint, own a camera, play an instrument, or like to garden), and there was no follow-up on the school’s part. My 9-year old son has a different perspective about growing up, and I’d like to share his insight with you. This Halloween, a night when we are free to choose who we want to be, my 9-year old son wore a white lab coat – but he didn’t want to be a scientist, an engineer, or a doctor. 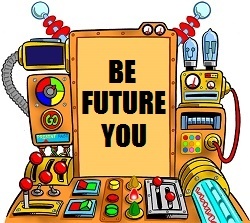 He wanted to be “Future Me.” He wanted to be himself, but in the future. It’s a subtle and surprisingly mature distinction. My son is not worried about what he will do in the future. He doesn’t want to be someone else, and he was a little annoyed that everyone thought he was a doctor. He just wants to be himself. My son taught me that we don’t need to encourage children to do something. We need to encourage them to be themselves. And we should either be happy with who we are today – or change who we are tomorrow. When you were young, what did you dream of doing? How did you know that you were “grown up”? We’ve lived at our house for 12 years, and we’ve accumulated a lot of “stuff” – remnants from our childhood, gifts, and things we’ve chosen for ourselves. Earlier this year, I looked around our home and realized that my home wasn’t making me as happy anymore. Over about three weeks this summer, I tidied up. It surprised me that I felt happy and relieved to discard things. I generally followed Kondo’s advice of starting with clothes, then books, papers, miscellany, and lastly mementos. * Clothes, toys, and household items. I donated 12 bags of gently-used items to United Cerebral Palsy of Hawaii. I got rid of clothes that don’t fit well or make me feel attractive (even if they look good on a hanger). This was one instance when I sorted through someone else’s things – my son’s baby clothes and toys – though I did set aside clothes that commemorate an event or activity, and saved some of his favorite toys. * Books. I donated 70 books to the public library. My favorite place in my home is my library, a corner of a room where I am surrounded by my favorite books. It was a struggle to weed through books that I have outgrown or that I don’t enjoy enough to keep, but I now have a little more space for more books. * Paper. I shredded 8 bags of old papers, tax returns, bank statements, and more. Would you believe that I found the first tax returns I ever filed? * Trash. I got rid of 28 bags of trash. Part of it went into our grey trash bin and part of it required a trip to the city dump. These were broken items, ungently used clothes and toys, and random stuff. One of my challenges was deciding which recycled items (like boxes or bottles) I could re-use or re-purpose – and then actually using them in crafts, instead of pointlessly storing them. If I felt guilty about discarding a gift someone gave me, or something that still had the tags on it, Kondo’s assurance really helped: I reminded myself that it had already served its purpose (a friend or relative’s thoughtfulness or a shopping pleasure) and it was okay to let it go so that someone else could enjoy it. I didn’t follow all of Kondo’s advice. Instead of sorting similar items all at once, I went room by room. We have too much stuff to be able to sort everything in a central location. I also ignored her advice about keeping storage simple. Living in Hawaii, I’ve learned to keep certain dry foods (like pasta and flour) and certain papers (like children’s artwork and school work) in dry, plastic containers to avoid insects and water. Finally, all of those plastic diaper wipes containers that I compulsively kept have come in handy – I’m using them to organize my drawers. The garage was my biggest roadblock, because it’s my husband’s domain. He has tools, equipment, appliances, home improvement materials, and yard tools. I couldn’t throw anything away, but I did try to organize it and make sure we have a clear walkway. Today, I’m probably the only one who notices how much less stuff we have, because so much of it was out of sight. Kondo warns us to let each person declutter and choose the things that make them happy, so I’ve left my husband’s and son’s things basically untouched. Though there is still a lot more tidying up that I can do, I appreciate how much lighter our house has become. Note: The fantastic drawing in this post is from Eastnine (ZZVE.com), free for non-commercial use. Today, we are all encouraged to take more initiative with our ideas – starting with school-aged children. There are many opportunities to be an entrepreneur in Hawaii, from sports teams fundraisers, Girl Scout cookie sales, and Keiki Swap Meets (through the Hawaii Children’s Discovery Center) to Lemonade Alley, which teaches Hawaii children about starting a business and charitable giving. You don’t have to be young to pursue a good idea. This week is dedicated to celebrating and encouraging entrepreneurs, innovators, and startup businesses for fun, for profit, or for giving it to a cause. * Startup Weekend Honolulu is going on this weekend, November 13-15, where hopeful entrepreneurs can pitch business ideas in just 60 seconds, vote for the top 15 ideas, form teams, and bring a business to life. The event takes place at Agora and Boxjelly in Kaka’ako over an intense 54 hours. I’m interested to see what ideas they bring to life! * Global Entrepreneurship Week starts next week, November 16-22, as a way to inspire more people become entrepreneurs and create more jobs. Through local and national events, it helps people explore their potential as entrepreneurs, connect innovators and mentors, and encourage business opportunities. I don’t think there are any Global Entrepreneurship Week partners or events in Hawaii yet – Pennsylvania and Texas seem to be the most active. As 20-somethings, my husband and I started a small business. We went to work during the day, and came home to our second job in the evening and on weekends. We didn’t expect to make a lot of money, just enough to add to our savings. We were young, with a lot of energy and no kids. We didn’t pay ourselves, but we saved up enough to help with the down-payment on our first home. A side benefit of working two jobs was that we had less time to spend the extra money we made. Don’t hesitate because it’s not your passion. You can grow a business from a kernel of passion or support someone else’s passion. Just be sure that it’s something you believe in, something you’re excited about, or something you’re good at. After all, you’ll be committing a lot of time to your business. Focus on “fringe benefits” – the people you meet (customers, partners, and vendors), the knowledge you gain, and the experience you earn. Don’t expect a big payoff in money, customers, or media attention. It’s okay to dream small. You don’t need to quit your job, use your life’s savings, or constantly pitch your business to family and friends. Keep your “day job” and set modest goals, such as breaking even (a hobby that pays for itself), earning enough for a weekend getaway, or setting aside some of your profits for a charity. Remember to plan for success anyway! Most of us can’t or shouldn’t make a leap of faith into entrepreneurship. A small business doesn’t have to be your life – it can be something we do on the side for extra income. It can be an excuse to pursue a hobby. It can just be something to keep us busy and out of trouble. Sometimes that kernel of passion bursts into popcorn; sometimes it’s a dud. Have you ever wanted to start your own business? What kind of business would you dream up? It’s hard for me to throw things away. I learned to let go of things after high school, because I moved around every few years. 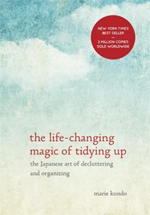 Now that I’ve lived in one house for over 10 years, I’ve accumulated a lot of “stuff.” So I was very interested to read “The Life-Changing Magic of Tidying Up: The Japanese Art of Decluttering and Organizing” (2014) by organization consultant Marie “KonMari” Kondo, translated from the Japanese by Cathy Hirano. According to Kondo, when your house is tidy, you can clearly see what is important to you. It gives you confidence in your decision-making capacity. It helps you see what you really need by getting rid of what you don’t need. It makes the home easier to clean. The air in home will be fresher. You will feel less stress about cleaning. You will buy fewer things and only buy things that make you feel happy. The KonMari Method of decluttering is deceptively simple: “Start by discarding. 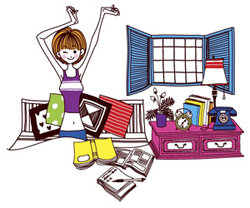 Then organize your space, thoroughly, completely, in one go.” Tidying up is about simplifying your life and surrounding yourself with things that make you happy. For each item, ask yourself: Does this spark joy? Sort by category, not place. We often store the same type of item in more than one location. Make tidying up a special event, not a daily chore. You can even dress nicely to show your respect. Finish the process of discarding before you decide where to keep things. Start with clothes, then books, papers, miscellany, and lastly mementos. Keep your garbage out of your family’s sight. It reduces the anxiety of hurt feelings, the lure of picking up discarded items, and the guilt of wasteful spending. Discard only your own things. Resist “keeping” clothes as “loungewear” (only worn in the house). What you wear in the home impacts your self-image. Only wear clothes that make you happy. Put all your clothes together so you can see what you have and what you really want to keep. When you put your clothes away, fold them standing up (not laid flat) and arrange your clothes by category, rising to the right, with heavy items on the left and light items on the right. Sort “komono” (miscellany) in this basic order: CDs/DVDs, skin care products, makeup, accessories, valuables, electrical equipment and appliances, household equipment, household supplies, kitchen goods/food supplies, hobby supplies, and other. Find your “just-right click point” – the point where you suddenly know how much is just right for you. Designate a place for each thing. Clutter happens because we don’t know where things belong. Keep storage solutions simple and out of sight. Categorize your belongings by item (one place for each type of item) or person (one storage area for each family member). Store things vertically – don’t pile things up. Remove tags and product labels right away and take things out of packages. Kondo also recommends that you greet your house or apartment when you come home, showing your appreciation for the shelter and comfort it gives you. Though I like a little clutter in my life – it makes a home feel lived-in – I can see how decluttering helps you appreciate what you have. It is a little easier to accomplish when living alone, mainly because Kondo warns us not to declutter someone else’s “stuff.” Decluttering seems especially helpful for people who live in small homes and apartments, to make the space feel larger and more of a sanctuary. Kondo writes, “A dramatic reorganization of the home causes correspondingly dramatic changes in lifestyle and perspective.” It’s a bold claim, and after reading this book, I believe it. Homelessness in Hawaii is not a “crisis.” A natural disaster is a crisis; it is a sudden, unexpected, singular event that has specific responses – we can send aid, help the wounded, and rebuild. By calling homelessness a “crisis,” we expect the one solution (or set of solutions) to “fix” the problem, and we expect it to go away. Homelessness is a part of everyday life. It is an on-going struggle, like care for the elderly, affordable health care, and aging infrastructure. It needs prompt and constant attention, not a one-time, expensive relief program. There will always be people who are homeless, sometimes temporarily, sometimes because of bad decisions, sometimes by choice. Our cities, our state, churches, and nonprofits are doing what they can, with programs to bus people to shelters, to find them housing, to provide “wrap-around” services, to support landlords. There is no one program that will end homelessness. That said, I want to suggest a strange, quirky, two-part mash-up idea to help with homelessness, inspired by existing programs: senior homes and school vouchers. It’s not based on any surveys, studies, or research; I don’t know whether this could even work. Part I: Care homes for the homeless. Inspired by care homes and hospice… we could set up a business model for people to open part of their home as a care home for the homeless. Each care home would provide 4 basic services: three meals a day (breakfast, a sack lunch, and dinner); a bed, bunk, or room at night (or during the day if someone works a night shift); daily access to a shower; and a storage locker for belongings. This could incentivize the creation of homes for the homeless, using a familiar business model that people already understand. Instead of a few large homeless shelters, we could have many smaller, close-knit homeless care homes. Larger providers, like shelters, churches, and YMCA-like organizations, could also provide 1 additional service: an enclosed room or fenced lawn for pets; and office space for 4 additional services, to be provided by government and nonprofit agencies: day care for toddler children and children who are on school breaks; medical and pharmacy services; job training and counseling; and English language tutoring, interpretation, and translation services. Part II: Homeless care vouchers. Inspired by school vouchers that give parents school choice … we could create homeless care vouchers that could be redeemed at a care home that has space for them. 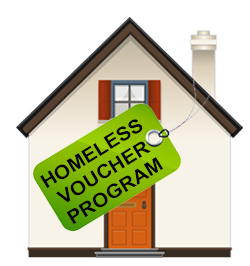 Instead of applying for multiple social services (food stamps, supplemental aid, welfare, and housing vouchers), homeless individuals and families would be issued a single voucher each month. They would be able to choose the best provider, location, and range of services that fit their needs. They would be part of a small group who could support and trust each other. They would have access to more nutritious meals. Providers would benefit from a voucher program. There would be guaranteed payment from the state for their services. They would also have an incentive to provide good care and compete with other providers for vouchers. Effective and courteous providers would receive more vouchers; less effective providers would improve or go out of business. There could be benefits for local government and taxpayers as well. State and city aid programs could be consolidated. There could be more accountability with a voucher program, since EBT cards can be abused or re-sold. Vouchers could also be adjusted with higher amounts for care providers who accept alcoholics, drug users, and the mentally ill (like Housing First, there would be no requirement to seek counseling before being admitted to a care home). How else can we change the way we think about homelessness? Are there other existing programs that we could adapt to help the homeless? You are currently browsing the Better Hawaii weblog archives for November 2015.